Internet commerce or e-commerce across Southeast Asia last year was worth US$50 billion according to a 2017 Google Temasek report. It is also predicted that Southeast Asia’s internet economy will grow to US$200 billion by 2025 driven mostly by the growth of online travel, e-commerce and online media. Amongst the 10 countries in the region, Indonesia is the fastest growing in terms of internet use with a 51 percent CAGR (compound annual growth rate) each year, according to a 2017 report by Hootsuite and We Are Social. A large portion of internet users in the archipelagic country participate in e-commerce. 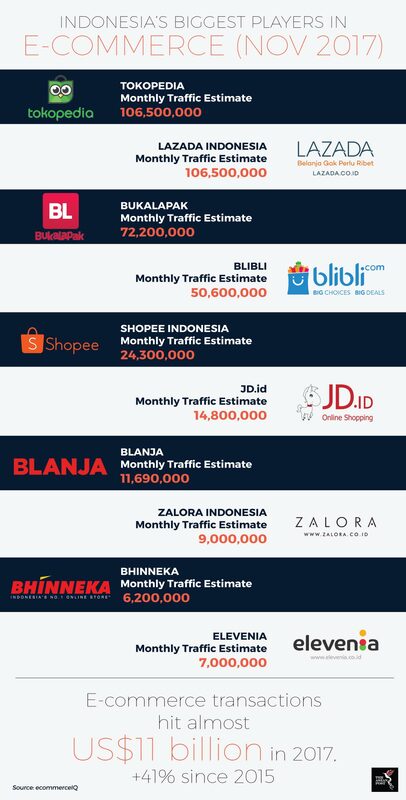 EcommerceIQ notes that there are 24.74 million e-commerce users who make up 19 percent of the entire population in Indonesia. Some of the big players in Indonesia’s e-commerce market include Lazada, Tokopedia, Bukalapak and Blibli. According to a report by Priceza - a shopping search engine and price comparison tool - clothes and fashion accessories were the most popular categories in Indonesia throughout 2017, with a total of 27% of total clicks received. This is followed by automotive (16%) and smartphones (12%). Meanwhile, based on gender, females make up a smaller portion (35.5%) of users compared to males (64.5%). Indonesian consumers usually visit Priceza’s website and mobile app to find a certain product or brand which they can then make a comparison with other similar products and brands before purchasing the item in an online store. According to data compiled, the average amount of money spent by consumers in one online transaction is IDR820,000. Throughout 2017, technology development especially in relation to e-commerce, has been growing rapidly. "E-commerce in 2018 will be heading towards User Generated Content (UGC), which is more or less related to the Indonesian consumer who loves to compare. As an example, reading a review or testimonial from a real user would affect one's purchase decision," explained Thanawat Malabuppha, CEO and co-founder of Priceza Group. These reviews are created based on the customer’s experience of a certain product or service which will then influence another buyers’ decisions. According to an A/B test conducted, products with reviews have a higher (57%) click through rate (CTR) compared to products without reviews. Big data has become an essential component of many successful e-commerce businesses that look to use information to help guide their future business decisions. To fulfil the needs of Indonesian e-commerce customers, retailers should adopt this technology. This will allow current and potential customers to search and compare products and prices more conveniently and efficiently. How does big data work for e-commerce? Big data helps retailers get personal with their customers. For example, when customers’ data has been collected and analysed with regards to their preferences, buying patterns and online browsing history, it’s easier to single out the products they are most likely to purchase. Big data will also be able to help determine the price threshold for each consumer, as exhibited by their past purchases. Other than that, the information that big data provides can help make little changes that can lead to big improvements for a retailer. When it comes to e-commerce, understanding customers’ buying patterns is key as there is little to no physical contact between an online retailer and them. But with the aid of technology, gathering information and insights about customers is now a breeze. Burgeoning e-commerce markets such as Indonesia will definitely flourish when retailers update their technology and take advantage of the data available to analyse consumer buying patterns and create a fair ecosystem for both, buyer and seller.